Google today unveiled version 4.3 of its popular Android mobile operating system, detailing some new firmware functionality including multi-user accounts with restricted profiles. “Parents can have peace of mind about which family members can access what content and which apps,” Google’s Hugo Barra said. It means device owners can control the way an app behaves in separate user profiles, such as the amount of content shown to other users. Barra demonstrated how with a children’s jigsaw app, the parent would be able to slowly give their child access to new puzzles by buying them privately in their own profile. These are then unlocked in the child’s version of the app while hiding any additional content unlocked through microtransactions. 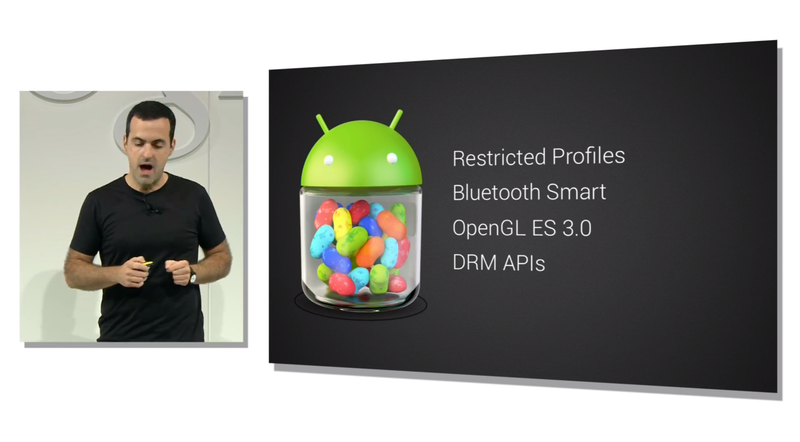 Android 4.3 also adds support for Bluetooth Smart technology – also known as Bluetooth Low Energy – enabling users to pair their Android smartphone or tablet with low powered devices such as fitness sensors. Google has also upped its Open GL support to version 3.0 for accelerated 3D graphics and higher fidelity graphic rendering, such as photorealistic lens flares, reflections, highlights and shadows. Version 4.3 also packs in a new set of DRM APIs that offer a new, standarized way of encrypting full HD content. Netflix is the first company to take advantage of the new capability, offering subscribers 1080p streams for the first time in its existing Android app. Google’s new Nexus 7 tablet is the only device that supports the technology right now, but more will be supported in the future. Android 4.3 adds a whole host of other minor adjustments and improvements, such as faster user-switching, an auto-complete dial pad – shown off in a hands-on video created by AndroidCentral last week – as well as new language support for Africaans, Amharic, Hindi, Swahili and Zulu. To coincide with the launch of Android 4.3, Google is also updating some of its in-house apps to take advantage of the 1080p display found in the new Nexus 7. 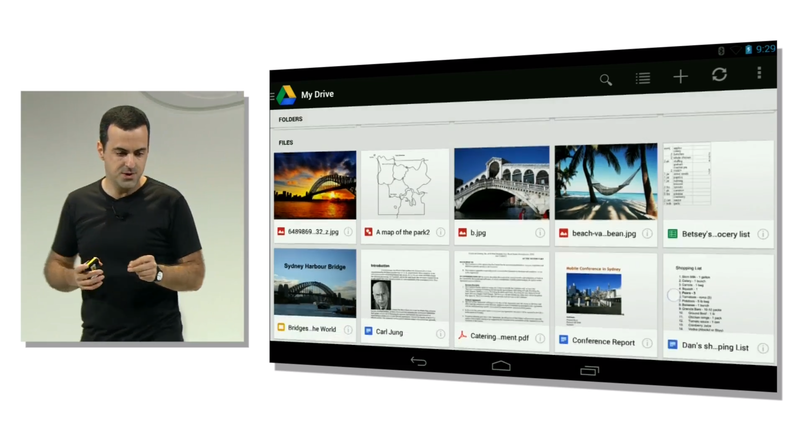 This includes Google Drive, which has been given a new tile layout with preview thumbnails. It’s remarkably similar to Google+, adding to the company’s new design consistency and enabling users to read notes without opening the file. There’s also a new navigation drawer, available from the right-hand edge of the screen, for quick access to starred documents and projects being shared with other users. Chrome has also been updated to take advantage of the new Nexus 7 tablet’s high-resolution display. There’s a full screen mode now, identical to the desktop version, giving users 15 percent more space to view content. Chrome also offers instant translations through a confirmation window that appears at the top of the page, enabling users to understand a much broader range of content from their tablet. The latest version of Jelly Bean will be available for the Galaxy Nexus, Nexus 4, original Nexus 7 and Nexus 10 later today, followed by the Google Edition HTC One and Samsung Galaxy S4 “soon”. It will, of course, also ship on the new Nexus 7 tablet.